You already know that Aviation Insurance Resources (AIR) offers a wide range of aircraft insurance options for aircraft of all makes and models, from Cessna Aircraft, Beechcraft, and Cirrus Aircraft to Robinson Helicopters, Piper Cubs, and Corporate Aircraft. But did you also know we are aviation enthusiasts ourselves? The AIR family enjoys getting out there and soaring the open skies. Sometimes we even bring our favorite four-legged friends along for the ride! AIR’s own Victoria Neuville has been seen flying on several occasions with her spaniel mix, Turbo, and pet hedgehog, Quillson. Below are Victoria’s accounts of two of those flights. It was at this airport that Victoria first laid eyes on her new puppy. Victoria was greeted by two male puppies, one brown and one white, from Dustin’s Angels pet rescue. As Victoria remembers, the people from Dustin’s Angels thought it was “so cool” that one of their puppies was being rescued by plane. After picking her puppy, a dog that would soon be named Turbo, and signing the contract it was time to take some photos and head back to Turbo’s new home. During the weekend of Victoria’s Uncle Tom’s 60th birthday, the family took a quick, half hour flight to Smoketown, Pennsylvania. Uncle Tom and his family were insistent that Victoria bring her pet hedgehog, Quillson. 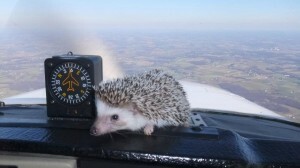 Victoria agreed to bring her prickly pet along and, much to her surprise, Quillson really enjoyed flying. 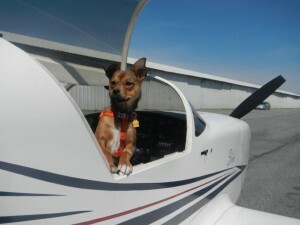 Both of Victoria’s pets have flown in Cessna and Glasair aircraft insured by AIR. To find out more about Flying with Pets or Aircraft Insurance, please contact Aviation Insurance Resources by calling 877-247-7767 or visit AIR-PROS.com today to receive your free Aircraft insurance quote! You can also follow us on Facebook, Twitter, LinkedIn, Pinterest, and Google+.